Crater edge in Terra Sirenum has been imaged by the High Resolution Imaging Science Experiment (HiRISE) camera on NASA's Mars Reconnaissance Orbiter. Gully watching thanks to repeat sweeps over the same landscape by orbiting spacecraft could catch gullies in action, if they are active today. Thanksto a flotilla of Mars orbiters,there's been a steady flow of information streaming in from that puzzlingworld. Scientists are piecing together a far more coherent view of "real time"versus "geological time" in dealing with the whole of Mars today. Oneof the more perplexing finds on Mars are features that look like the product ofgroundwater seeping to the surface. These gullies could be formed by flowingwater--perhaps fed by a groundwater supply. Deposits of soil and rockstransported by these flows have been found too. Moreimportantly, gully features appear to be young. So young, in fact, they mightbe forming today. Clearly, gullies may well be areas of astrobiologialinterest--aniche for life that could be present and accounted for on Mars. Itwas back in June 2000 when Mars gullies became bignews--new landforms that had never been seen before as revealed in imagestaken from the Mars Global Surveyor. Spacecraft have now been sending backviews of the planet and its ever-changing face over the course of the past fiveMartian years. Marsgullies remain controversial as to how they are created. But now gully watchingscientists are nearing a watershed moment in unraveling the story behind theformations. Gulliesare high on a "change detection" target list for NASA's newly positioned MarsReconnaissance Orbiter (MRO).Onboard that Mars-circling craft is the ultra-powerful High Resolution ImagingScience Experiment (HiRISE)camera. "HiRISEcan do an excellent job of change detection due to the high resolution" andother attributes of the imaging system, said Alfred McEwen, Director of the PlanetaryImage Research Lab at the University of Arizona in Tucson, Arizona. He is MRO'sHiRISE principal investigator. "Weare planning a major effort for change detection over many terrains on Mars,"McEwen told SPACE.com, such as polar layereddeposits, dunesand gullies. MRO'spoint-and-shoot skills also enable re-imaging of terrains at the exact sameseason of different Mars years to match illumination angles. "Viewingangles will differ, but we plan to acquire stereo images and produce digitalelevation models of any site that shows evidence for change ... so we cancorrect for any viewing effects and make precise measurements of changes,"McEwen noted. "Wewill of course see changes in color and albedo [variations in the amount ofsunlight reflected by the martian surface] but interpretation of such surficialchanges can be controversial," McEwen said. "So our hope is to detect andmeasure actual changes in the topography." Therefore,MRO can constrain the current rates of change of features, McEwen added, likethe age of younger features such as gullies--even if the spacecraft and Marsinvestigators doesn't actually spot new gully erosion. Thetrue nature of the Mars gullies remains a work in progress, said Linda Martel,a geologist and an educational outreach staffer at the Hawaii Institute ofGeophysics and Planetology at the University of Hawaii. "Mostresearchers are still favoring two models of formation for gullies on Martianslopes--erosion caused by groundwater discharge or by the melting ofnear-surface ice or snow," Martel advised. Mappingthe locations and orientations of gullies continues, with Mars scientistslooking at temperature and pressure conditions in the subsurface that allowliquid water to exist where gully recesses are found. Also, they are evaluatingatmospheric conditions and exposure of the surface to martian sunshine. "Theyare coming up with very convincing reasons why either model makes sense,"Martel said. "But when researchers say that gullies are recent they aren'ttalking about today, right now." Forone, Martel said, it's impossible to carve the larger--about 4 miles (7kilometers) long--gullies by flowing pure water across the surface under today'stemperature and pressure conditions on Mars. An on-going research focus, shesaid, is appreciating what the gullies say about changes in the stability ofwater or changes in atmospheric pressure, temperature, humidity or exposure tosunshine on Mars. Evidencethat water is carving out martian gullies doesn't, well, hold water in somecircles. The Moon has gullies that look strikingly familiar to the ravines onMars--and water certainly didn't form gullies on that bone-dry world. 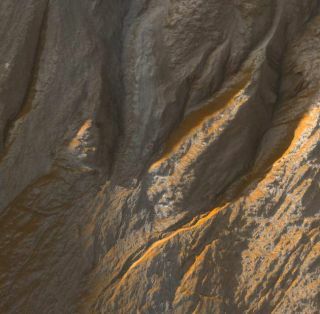 Marsgullies are made up of a deep channel with a collapsed region at its upperend--an "alcove"--and at the other end an area of accumulated debris--an "apron"that appears to have been transported down the slope. "Becausethe Moon is devoid of geologically active water, we know the lunar featuresformed by dry landslides," Bart observed. "As a result, it is impossible torule out dry landslides as the formation mechanism for martian gullies, basedsolely on the alcove-channel-apron morphology." Bartsaid that more high resolution lunar data--like that expected from NASA's super-snoopingLunar Reconnaissance Orbiter to be launched in 2008--will give researchers theability to identify more lunar features, and to see whether the Moon reproducesthe great variety of gullies spotted on Mars. "Itis my opinion that there easily could be active melting or release of waterfrom sub-surfaceaquifers," said Philip Christensen at Arizona State University (ASU) in Tempe, a leading Marsresearcher. He is Principal Investigator for the 2001 MarsOdyssey's Thermal Emission Imaging System (THEMIS) instrument. Christensensaid that he believes some of the Mars gullies emanate from dust-coveredsurface snowpacks. Small, local changes in the conditions of these snowpacks--suchas wind or landslides removing the dust cover--could allow these snows to beginto melt and release water today, he advised. "Themain argument against a lot of current activity is that these snowpacks likelyformed during the previous climate cycles and are 50,000 to 300,000 years old,"Christensen told SPACE.com. "If they had remained active all that timethey would be completely gone by now." However,Christensen added, if the snowpacks get covered by a protective layer of dust,then the snow can be stable for a long time. Remove the dust and the melting isreactivated, then gullies could be eroding in some places on Mars today, hesaid. "Alternatively,if the water is coming from sub-surface aquifers or ground ice ... localheating or other local changes could also release water and these gullies couldalso be active," Christensen suggested. Inhis view, Christensen said that all this gully-speak leads to some keyquestions regarding the red planet. Forone, what is the nature of near-surface snow and water in the mid-latituderegions? "Theseregions are extremely interesting," Christensen remarked, "because they're coldenough for snow and ice to accumulate during climate cycle--but warm enough formelting and release of liquid water to occur at other times ... perhaps currenttimes." Theequatorial regions appear very dry today, Christensen noted, and the poles arevery cold throughout the year. "Thegullies indicate that there is snow or water near the surface in themid-latitudes," Christensen pointed out. "This is where I think a lot of theaction and excitement on Mars is occurring today." Sowhy not send a robot to get up-close and personal with a Mars gully? NASA'sMars Science Laboratory (MSL),now being built for a 2009 sendoff to the red planet, won't be up to sterilitysnuff to explore a gully site due to planetary protection rules. Gulliesfor MSL are off limits, no wheel zones. You don't want to infect possible martianmicrobes or water sources with hitchhiking bacteria brought from Earth. "Gulliesappear to be the bestchance we will have--or perhaps could have--for seeking present-day life onthe martian surface," suggested John Rummel, Senior Scientist for Astrobiologyin the Science Mission Directorate at NASA Headquarters in Washington, D.C.
Forastrobiologists, Rummel continued, there is no more compelling target thangullies for exploration on Mars. But there's need for the right rover that'soutfitted with the right instruments before we go, he said. Delvinginto Mars gullies, Rummel said, can be extended from orbit around the planet--oreven from platforms flying through the martian atmosphere, like roboticairplanes or balloons. "Butthe most important phase of the exploration of the gullies can only be done byvisiting them and making measurements on site," Rummel said. "To do thisrequires an agile, sterile rover and finely tuned analytical instruments ...but with those tools, we have perhaps the best chance this century to discoverwhether or not Mars is alive." This article is part of SPACE.com's weekly Mystery Mondayseries.